Hollybeary Creations : National Craft Month with Right at Home!! National Craft Month with Right at Home!! Happy Sunday everyone.. I'm so excited to be joining Nicole from Right at Home and a few friends to celebrate National Craft Month!! If you haven't visted the Right at Home blog be sure to head over and see what Nicole created and check out what the other guest created this past week as part of the celebration!! 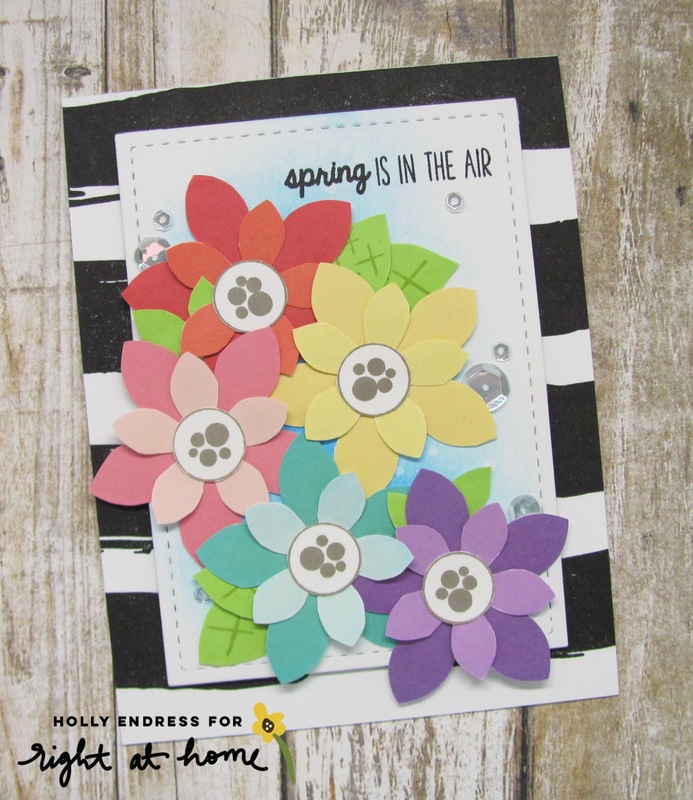 Each day this week there has been a new challenge...Today's Challenge is to create a Spring card using a Holiday item. I started my card by creating the striped background on an A2 sized White card base with the Watercolor Background Stamp. This is my Favorite background Stamp in my stash hands down! I stamped the background in VersaFine Black ink and set it aside to dry. Then I die cut a piece of watercolor paper using the smaller stitched rectangle in the Find the Beauty Die set. I added some Salty Ocean Distress Oxide Ink and a few spritz of Water. Once the panle was dry I stamped the sentiment from the Hoppy Easter Set (Discontinued) and then I adhered the panel to the cardfront with some Foam tape. I stamped several of the different sized Poinstettas and Leaves from the Poinsettas Stamp Set using different shades of ink from WPlus9. Once the were all stamped I fussy cut them out and then I layered each of them with some glue dots. I adhered each flower on the watercolor panel and then tucked the leaves in behind them. I wanted a little pop of sprakle so I added a few Mixed Spakling Clear Sequins from Pretty Pink Posh. This is a great way to use your Christmas stamps throughout the year. Wanna join in the Fun? The National Craft Month Celebration runs March 19th through the 26th. 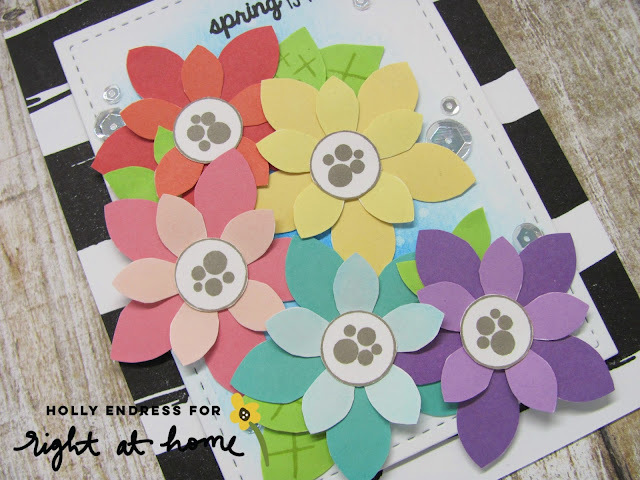 Head over to the Right at Home Blog and see what Nicole created today with the challenge and be sure to scroll back and see the other challenges!